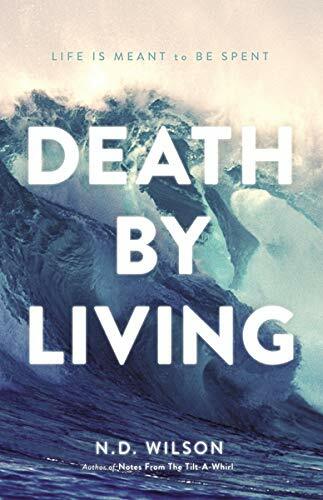 I received this book as part of a blog tour promotional for N. D. Wilson's latest book, Death By Living. I was expecting DBL in the package, I was pleasantly surprised by Tilt-A-Whirl (TAW). But if you read my blog regularly, you know this already. Last week my family went on a week-long cruise that was complete with two (2) days at sea. I took the opportunity to supplement my nightly chapters with several helpings of TAW and DBL while lounging on deck and consuming mountains of food. Hey, it was heavenly! I dealt with the problem of N. D. Wilson and the Stream of Consciousness Writing Style in my review of TAW (published a couple of days ago). I stand by my remarks that this intentional maelstrom of description is deliberate and beautiful. He did not just barf up vocabulary words on a page, he sculpted a beautiful piece of literature. I also give this piece 4 out of 5 stars of technical merit. I did notice that Wilson was able to sculpt this more closely around a topic: live like you know you will die, because that is certain. It is a sort of Christian carpe diem. Seize the day. Redeem the time for the days are evil. I suppose that is what was meant by the subtitle: Life is meant to be spent. By the end of the book, I realized that this was more than just a Christian self-help book, it was a memoir. A family memoir. It reads as a tribute to all four of N. D. Wilson's grandparents, who serve as the muses which get Wilson to think of the brevity of life and what types of things should occupy his own remaining moments. We cannot see every moment of our own stories, let alone any other mortal story. None of us even have first-hand knowledge of our own early years of existence—what we thing we know is all taken on faith. N. D. Wilson proves that Solomon was right when he said that it is good to be in the house of mourning. Through the lives of influential people in his life, he found inspiration to write DBL. Through the loss of these men and women of faith, he was urged to reflect on the meaning of life and write this excellent book. Again, like TAW, I recommend this book with caution. If you are not easily offended by some irreverent humor or afraid to look at the world as it is, then I heartily recommend this book. If you are, I would suggest reading something a bit milder. I have mentioned that I received this book free of charge. I was asked to write this review and post it on August 30. As you can see, I have done so. However, I would have done it anyways because I like to review the books I read. I'm not being payed for these services though I would love to be. Call this a disclaimer if you will, but that is the truth.